The data and analyses here were inspired by the Tidy Tuesday project – a weekly social data project in R from the R for Data Science online learning community @R4DScommunity. We’re going to use two different data sets. 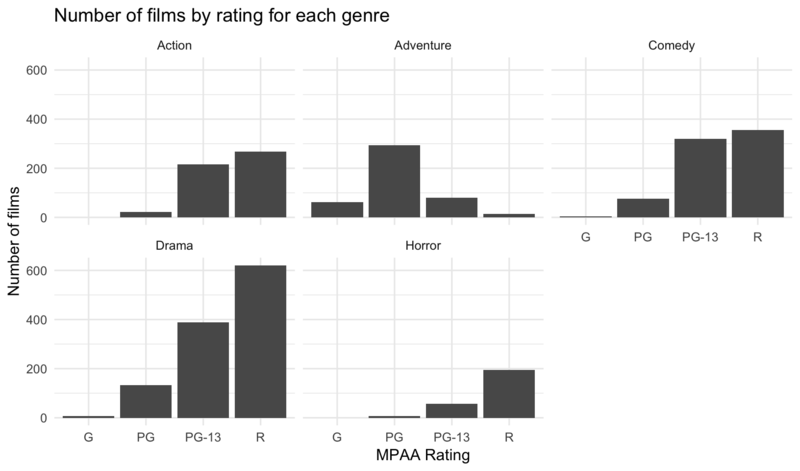 One containing data on movie budgets and profits that was featured in a FiveThirtyEight article on horror movies and profits, and another with data on college majors and income from the American Community Survey. Packages needed for this analysis are loaded below. If you don’t have one of these packages installed, simply install it once using install.packages("PackageName"). A quick note on the tidyverse package (https://www.tidyverse.org/): the tidyverse is a collection of other packages that are often used together. When you install or load tidyverse, you also install and load all the packages that we’ve used previously: dplyr, tidyr, ggplot2, as well as several others. Because we’ll be using so many different packages from the tidyverse collection, it’s more efficient load this “meta-package” rather than loading each individual package separately. I’ll demonstrate some functionality from these other packages. They’re handy to have installed, but are not strictly required. The raw data can be downloaded here: movies.csv. 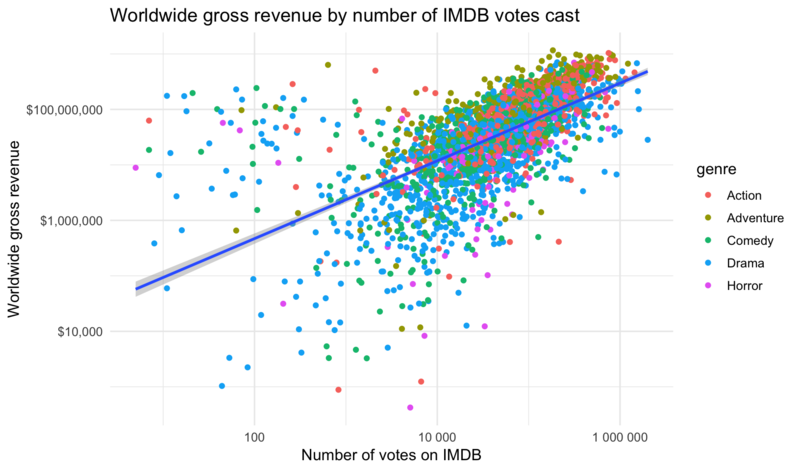 This data was featured in the FiveThirtyEight article, “Scary Movies Are The Best Investment In Hollywood”. “Horror movies get nowhere near as much draw at the box office as the big-time summer blockbusters or action/adventure movies – the horror genre accounts for only 3.7 percent of the total box-office haul this year – but there’s a huge incentive for studios to continue pushing them out. The return-on-investment potential for horror movies is absurd. For example, “Paranormal Activity” was made for $450,000 and pulled in $194 million – 431 times the original budget. That’s an extreme, I-invested-in-Microsoft-when-Bill-Gates-was-working-in-a-garage case, but it’s not rare. And that’s what makes horror such a compelling genre to produce." – Quote from Walt Hickey for fivethirtyeight article. If you haven’t already loaded the packages we need, go ahead and do that now. Now, use the read_csv() function from readr (loaded when you load tidyverse), to read in the movies.csv dataset into a new object called mov_raw. Let’s clean up the data a bit. Remember, construct your pipeline one step at a time first. Once you’re happy with the result, assign the results to a new object, mov. Get rid of the blank X1 Variable. Change release date into an actual date. Calculate the return on investment as the worldwide_gross/production_budget. Calculate the percentage of total gross as domestic revenue. Get the year, month, and day out of the release date. Remove rows where the revenue is $0 (unreleased movies, or data integrity problems), and remove rows missing information about the distributor. Go ahead and remove any data where the rating is unavailable also. 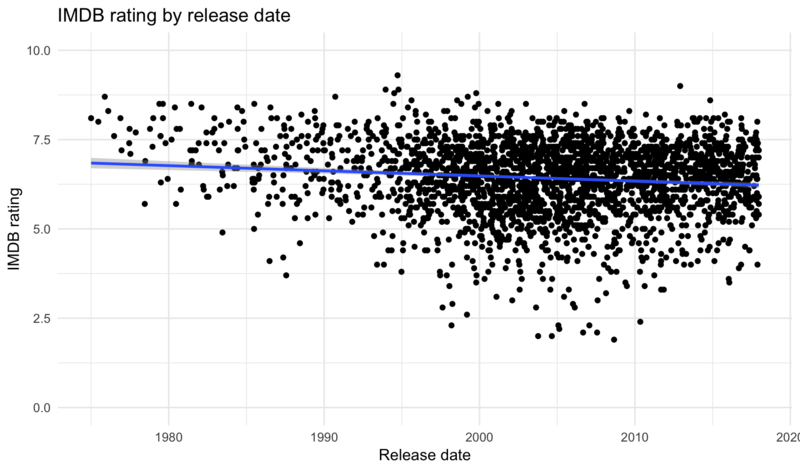 Let’s take a look at the distribution of release date. 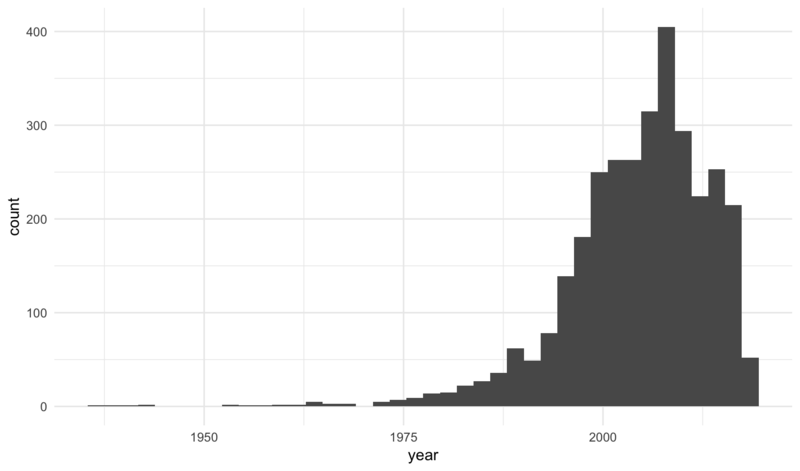 There doesn’t appear to be much documented berfore 1975, so let’s restrict (read: filter) the dataset to movies made since 1975. Also, we’re going to be doing some analyses by year, and since the data for 2018 is still incomplete, let’s remove all of 2018. Let’s get anything produced in 1975 and after (>=1975) but before 2018 (<2018). Add the final filter statement to the assignment, and make the plot again. 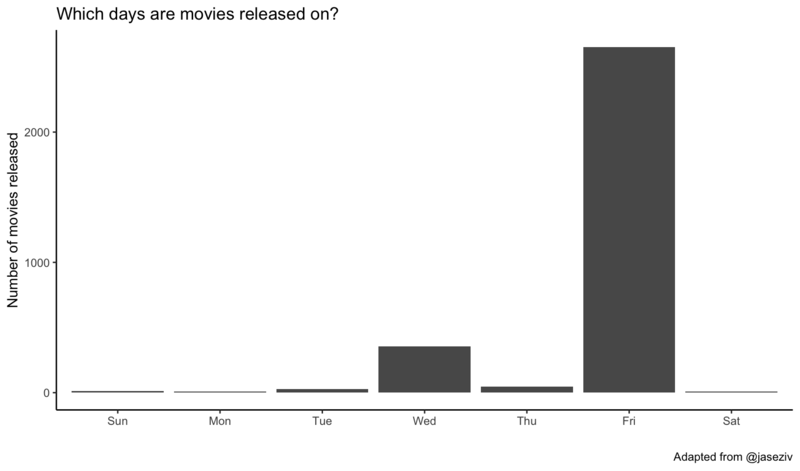 Which days are movies released on? The dplyr count() function counts the number of occurances of a particular variable. It’s shorthand for a group_by() followed by summarize(n=n()). The geom_col() makes a bar chart where the height of the bar is the count of the number of cases, y, at each x position. Feel free to add labels if you want. 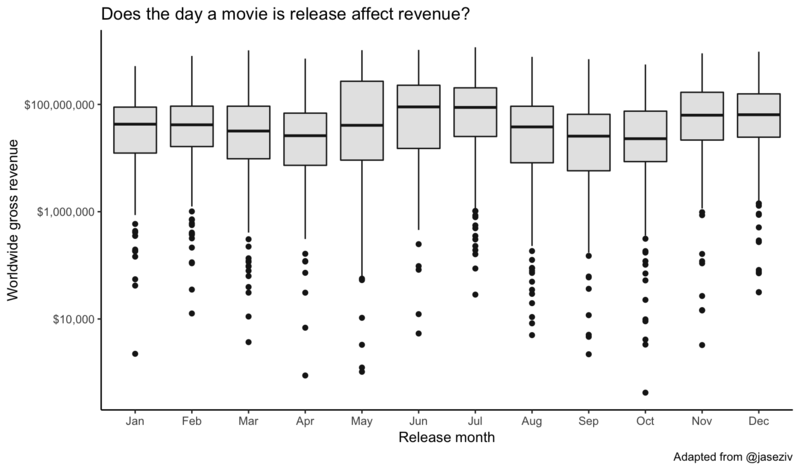 Does the day a movie is release affect revenue? 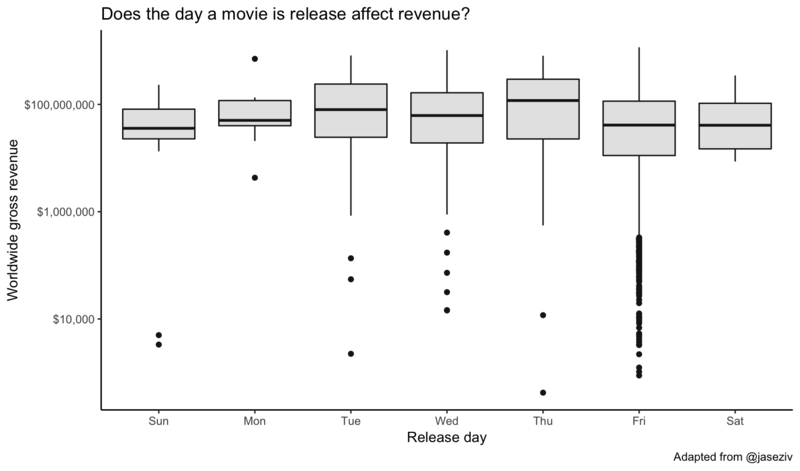 Make a boxplot showing the worldwide gross revenue for each day. What about month? Just swap day for month in the code. It looks like summer months and holiday months at the end of the year fare well. Let’s look at a table and run a regression analysis. 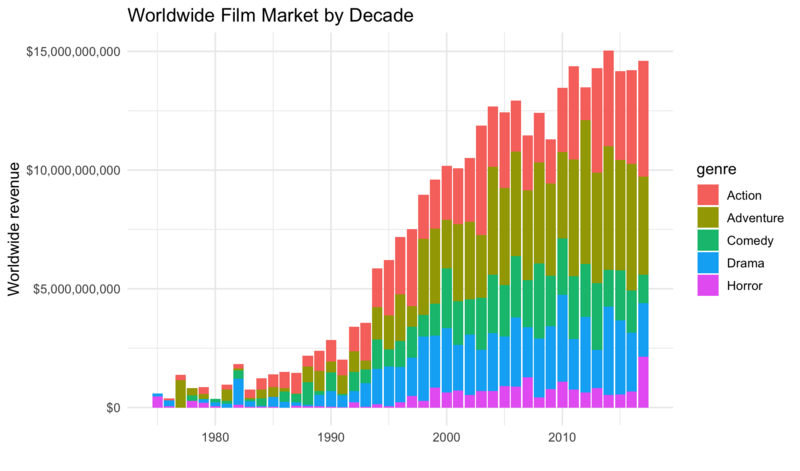 What does the worldwide movie market look like by decade? 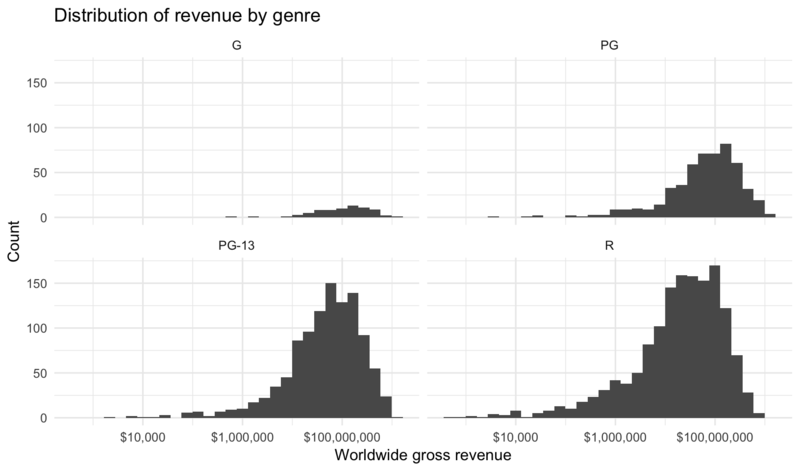 Let’s first group by year and genre and compute the sum of the worldwide gross revenue. After we do that, let’s plot a barplot showing year on the x-axis and the sum of the revenue on the y-axis, where we’re passing the genre variable to the fill aesthetic of the bar. 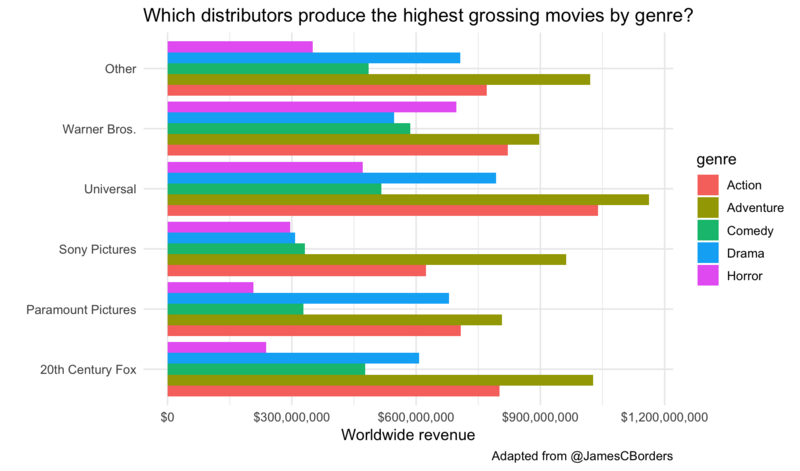 Which distributors produce the highest grossing movies by genre? First let’s lump all distributors together into 5 major distributors with the most movies, lumping all others into an “Other” category. The fct_lump function from the forcats package (loaded with tidyverse) will do this for you. Take a look at just that result first. Then let’s plot a geom_col(), which plots the actual value of the thing we put on the y-axis (worldwide gross revenue in this case). Because geom_col() puts all the values on top of one another, the highest value will be the one displayed. Let’s add position="dodge" so they’re beside one another instead of stacked. We can continue to add additional things to make the plot pretty. I like the look of this better when we flip the coordinate system with coord_flip(). It looks like Universal made the highest-grossing action and adventure movies, while Warner Bros made the highest grossing horror movies. 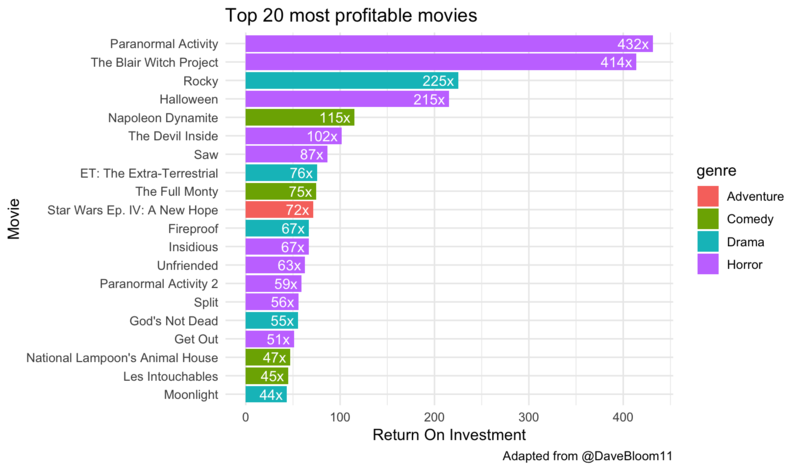 It looks like horror movies have overwhelmingly the highest return on investment. Let’s look at this across the top distributors. Modify the code above to look at return on investment instead of worldwide gross revenue. 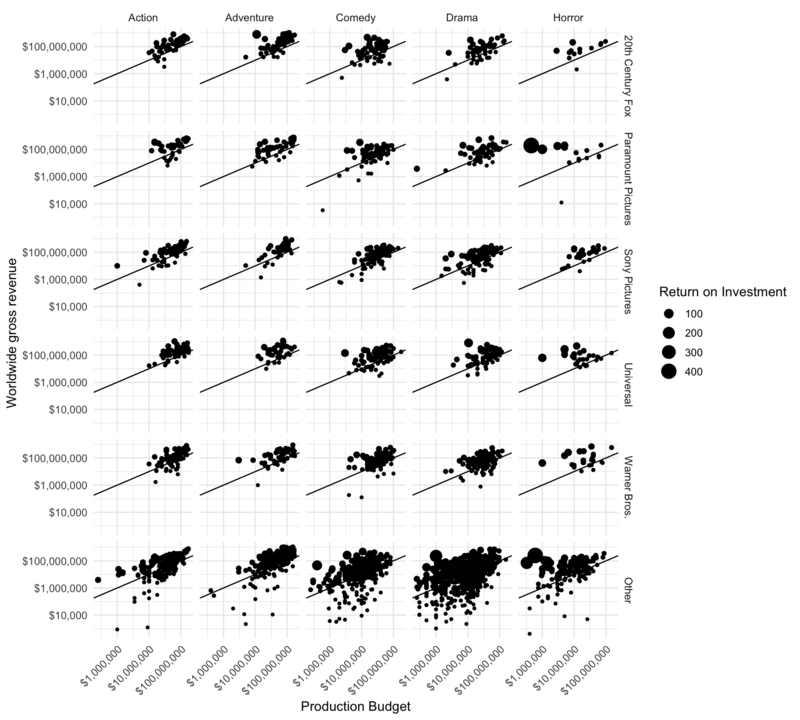 Let’s make a scatter plot showing the worldwide gross revenue over the production budget. Let’s make the size of the point relative to the ROI. Let’s add a “breakeven” line that has a slope of 1 and a y-intercept of zero. Let’s facet by genre. Generally most of the points lie above the “breakeven” line. This is good – if movies weren’t profitable they wouldn’t keep making them. Proportionally there seem to be many more larger points in the Horror genre, indicative of higher ROI. Let’s create a faceted grid showing distributor by genre. Paramount and Other distributors have the largest share of low-budget high-revenue horror films. What were those super profitable movies? Looks like they’re mostly horror movies. 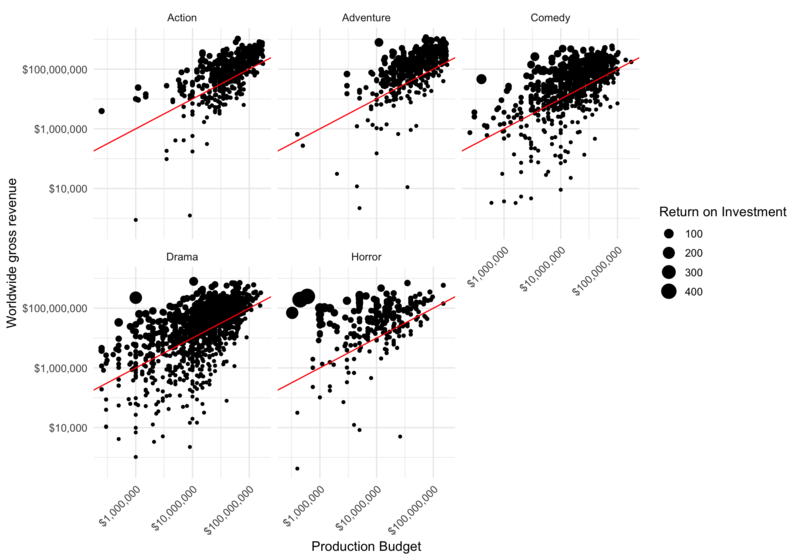 One thing that’s helpful to do here is to make movies a factor variable, reordering its levels by the median ROI. Look at the help for ?fct_reorder for this. I also like to coord_flip() this plot. It might be informative to run the same analysis for movies that had either exclusive US distribution, or no US distribution at all. We could simply filter for movies with 100% of the revenue coming from domestic gross revenue US only, or 0% from domestic (no US distribution). Just add a filter statement in the pipeline prior to plotting. What about movie ratings? 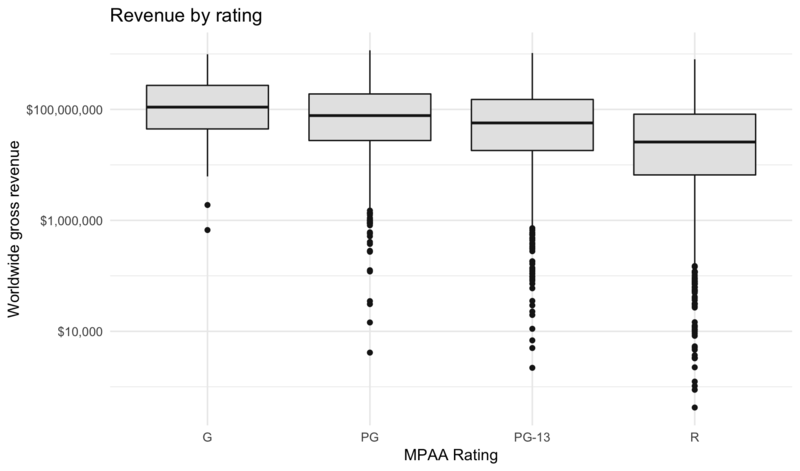 R-rated movies have a lower average revenue but ROI isn’t substantially less. The n() function is a helper function that just returns the number of rows for each group in a grouped data frame. 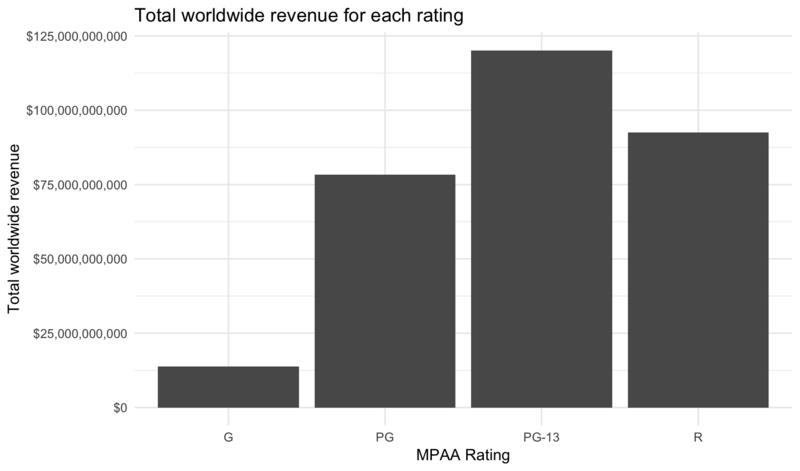 We can see that while G-rated movies have the highest mean revenue, there were relatively few of them produced, and had a lower total revenue. There were more R-rated movies, but PG-13 movies really drove the total revenue worldwide. Are there fewer R-rated movies being produced? Not really. 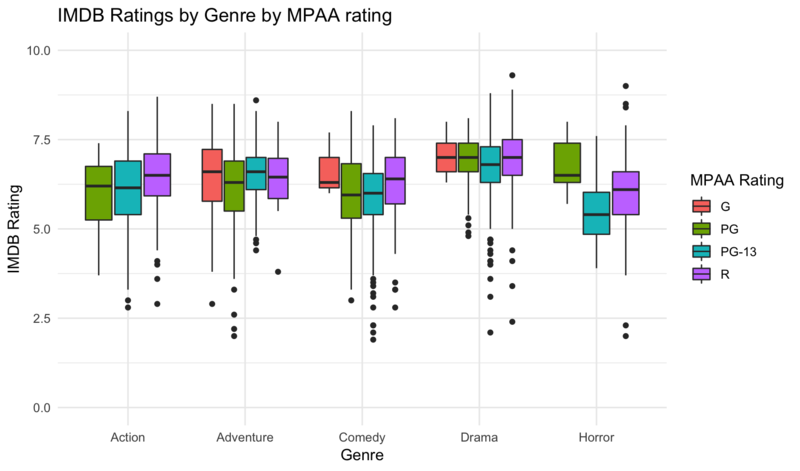 Let’s look at the overall number of movies with any particular rating faceted by genre. What about the distributions of ratings? But, dont be fooled. Yes, on average G-rated movies look to perform better. But there aren’t that many of them being produced, and they aren’t bringing in the lions share of revenue. It turns out there are only 2,591 rows in the joined dataset. That’s because there were some rows in mov that weren’t in imdb, and vice versa. Some of these are truly cases where there isn’t an entry in one. Others are cases where it’s Star Wars Ep. I: The Phantom Menace in one dataset but Star Wars: Episode I - The Phantom Menace in another, or Mr. & Mrs. Smith versus Mr. and Mrs. Smith. Others might be ascii versus unicode text incompatibility, e.g. the hyphen “-” versus the endash, “–”. Now that you have the datasets joined, try a few more exercises! 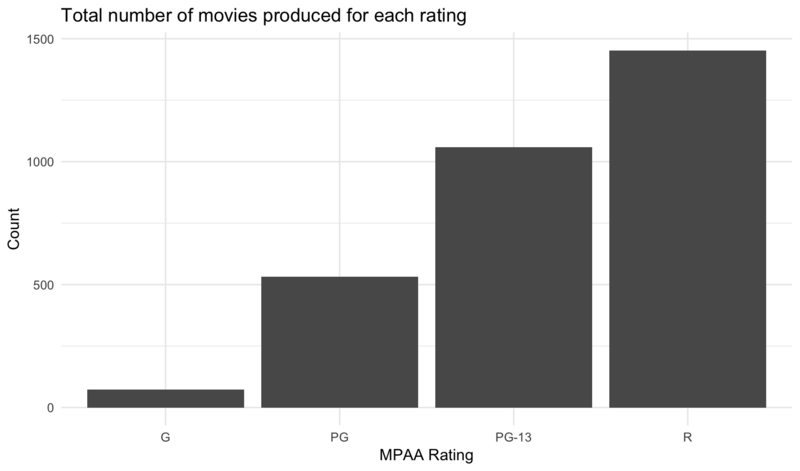 Separately for each MPAA rating, display the mean IMDB rating and mean number of votes cast. ## 1 G               6.54   132015. ## 2 PG              6.31    81841. ## 3 PG-13           6.25   102740. ## 4 R               6.58   107575. Do the same but for each movie genre. ## 1 Action        6.28   154681. ## 2 Adventure     6.27   130027. ## 3 Comedy        6.08    71288. ## 4 Drama         6.88    91101. ## 5 Horror        5.90    89890. Do the same but for each distributor, after lumping distributors in a mutate statement to the top 4 distributors, as we’ve done before. ## 1 Paramount Pictures     6.44   130546. ## 2 Sony Pictures          6.25   111913. ## 3 Universal              6.44   130028. ## 4 Warner Bros.           6.37   133997. ## 5 Other                  6.46    86070. Create a boxplot visually summarizing what you saw in #1 and #2 above. 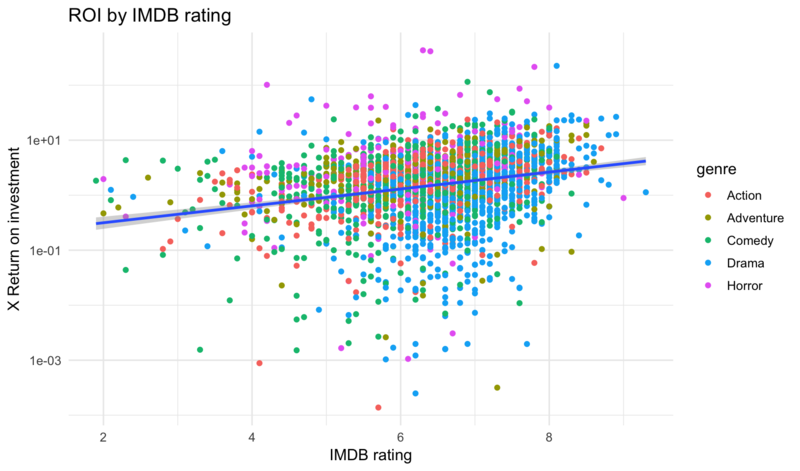 That is, show the distribution of IMDB ratings for each genre, but map the fill aesthetic for the boxplot onto the MPAA rating. Here we can see that Dramas tend to get a higher IMDB rating overall. Across most categories R rated movies fare better. We also see from this that there are no Action or Horror movies rated G (understandably!). In fact, after this I actually wanted to see what the “Horror” movies were having a PG rating that seemed to do better than PG-13 or R rated Horror movies. 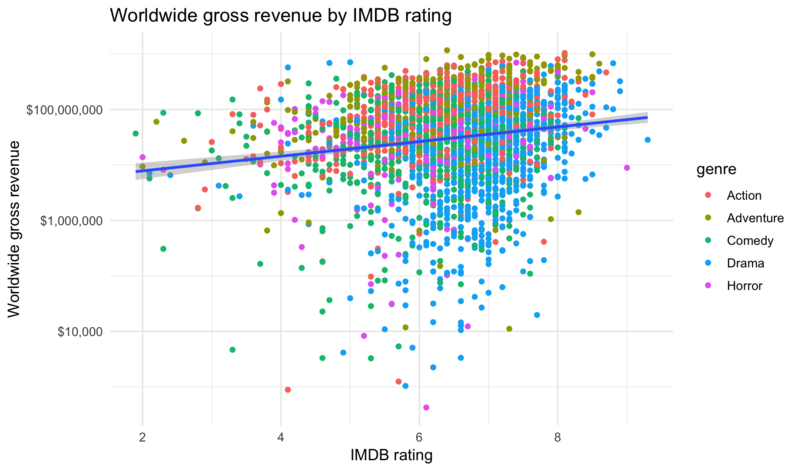 Create a scatter plot of worldwide gross revenue by IMDB rating, with the gross revenue on a log scale. Color the points by genre. Add a trendline with method="lm". 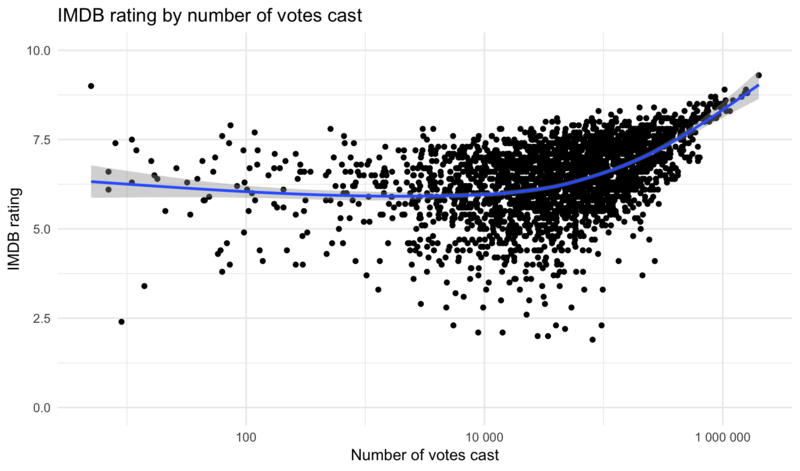 Create the same plot, this time putting the number of votes on the x-axis, and make both the x and y-axes log scale. Create the above plots, but this time plot the ROI instead of the gross revenue. Is there a relationship between the release date and the IMDB ratings or votes cast? Surprisingly, there doesn’t appear to be one. 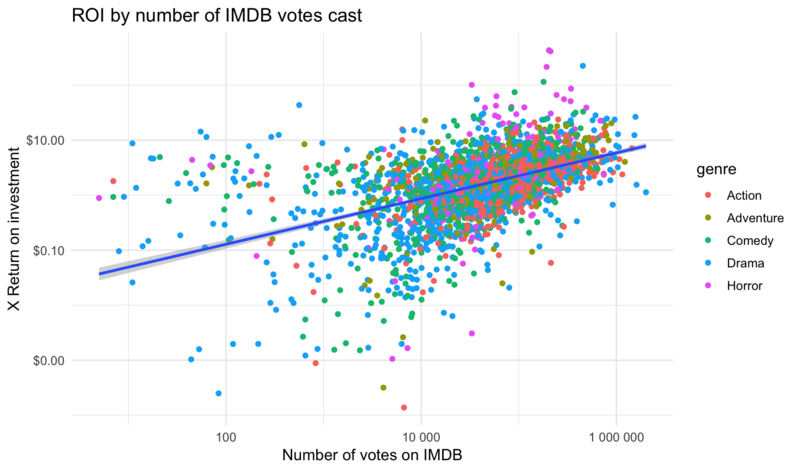 Is there a relationship between the IMDB rating and the number of votes cast? It appears so, at least as you get toward the movies with the very largest number of ratings. 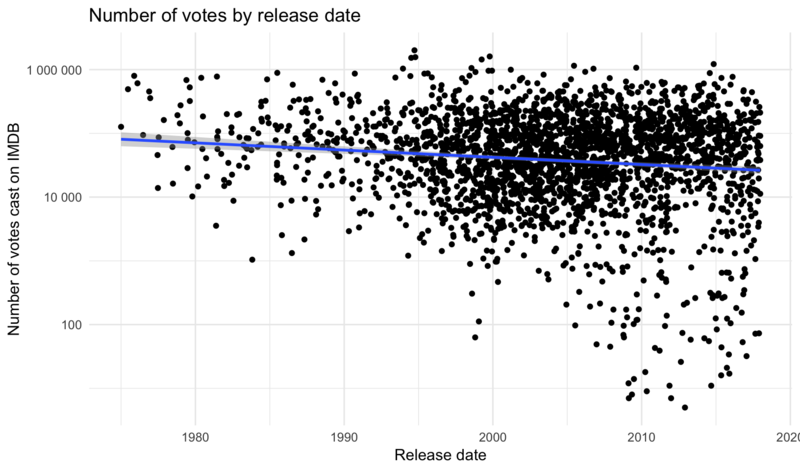 Looking at that above plot, I’m interested in (a) what are those movies with the largest number of votes? and (b) what are those movies with at least 50,000 votes that have the worst scores? No surprises there. These are some of the most universally loved films ever made. 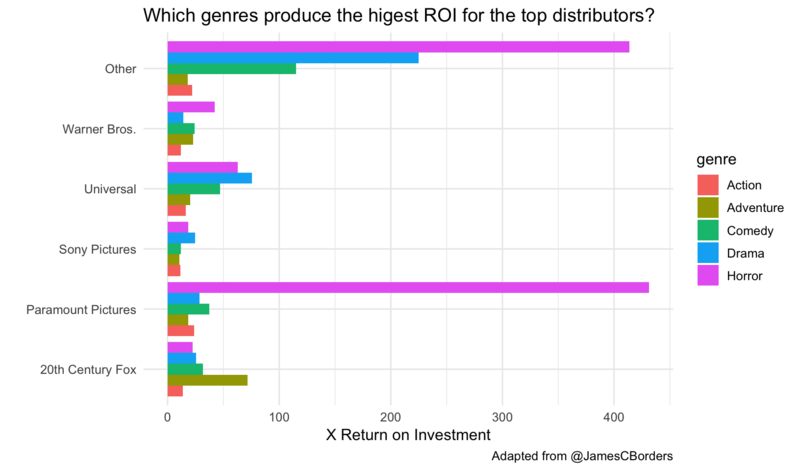 Interesting that the return on investment varies wildly (1.13x for the highest rated movie of all time, up to 26x for Pulp Fiction, which had to pay for an all-star cast). Interesting that several of these having such terrible reviews still have fairly high return on investment (>14x for Fifty Shades of Grey!). 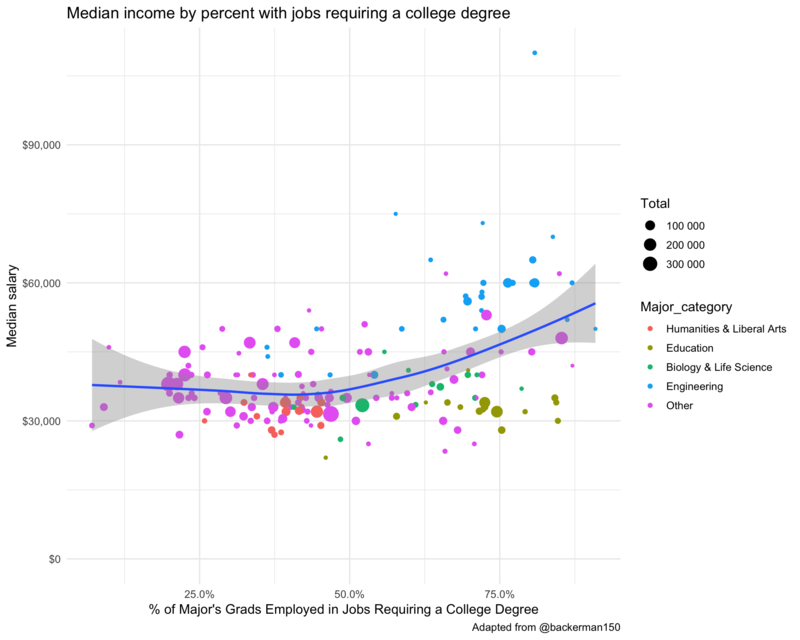 This is the data behind the FiveThirtyEight article, “The Economic Guide To Picking A College Major”. All data is from American Community Survey 2010-2012 Public Use Microdata Series. Original data and more: http://www.census.gov/programs-surveys/acs/data/pums.html. Now, use the read_csv() function from readr (loaded when you load tidyverse), to read in the grads.csv dataset into a new object called grads_raw. Read in the raw data. Now clean it up a little bit. Remember, construct your pipeline one step at a time first. Once you’re happy with the result, assign the results to a new object, grads. Make sure the data is arranged descending by Median income. It should be already, but don’t make any assumptions. Make the Major sentence case so it’s not ALL CAPS. This uses the str_to_title() function from the stringr package, loaded with tidyverse. Make it a factor variable with levels ordered according to median income. Do the same for Major_category – make it a factor variable with levels ordered according to median income. Add a new variable, pct_college, that’s the proportion of graduates employed in a job requiring a college degree. We’ll do some analysis with this later on to look at under-employment. There’s one entry (“Military technologies”) that has no data about employment. This new variable is therefore missing. Let’s remove this entry. There’s an entry with an unknown number of total majors, men, or women (“Food Science”). Let’s remove it by removing anything with a missing Total number. Remake table 1 from the FiveThirtyEight article. Use the select() function to get only the columns you care about. Use head(10) or tail(10) to show the first or last few rows. If you have the DT package installed, you can make an interactive table just like the one in the FiveThirtyEight article. Let’s continue with more exploratory data analysis (EDA). 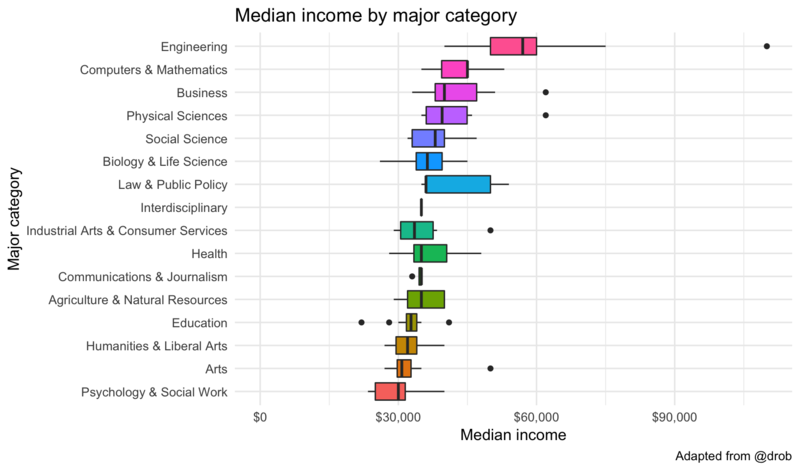 Let’s plot median income by the total number of majors. 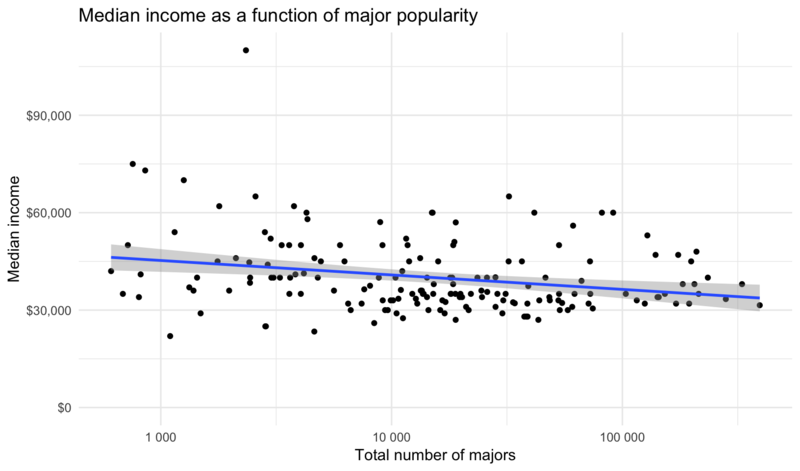 Is there a correlation between the number of people majoring in a topic and that major’s median income? The expand_limits lets you put $0 on the Y-axis. You might try making the x-axis scale logarithmic. You could run a regression analysis to see if there’s a trend. 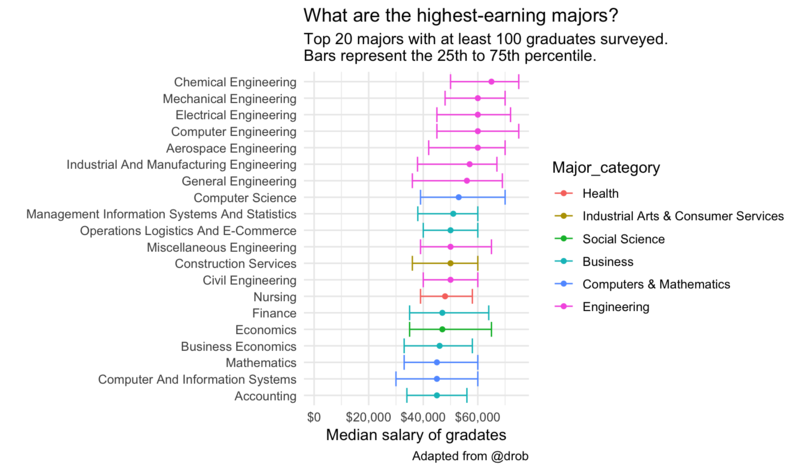 What categories of majors make more money than others? Let’s make a boxplot of median income by major category. Let’s expand the limits to include 0 on the y-axis, and flip the coordinate system. What about unemployment rates? 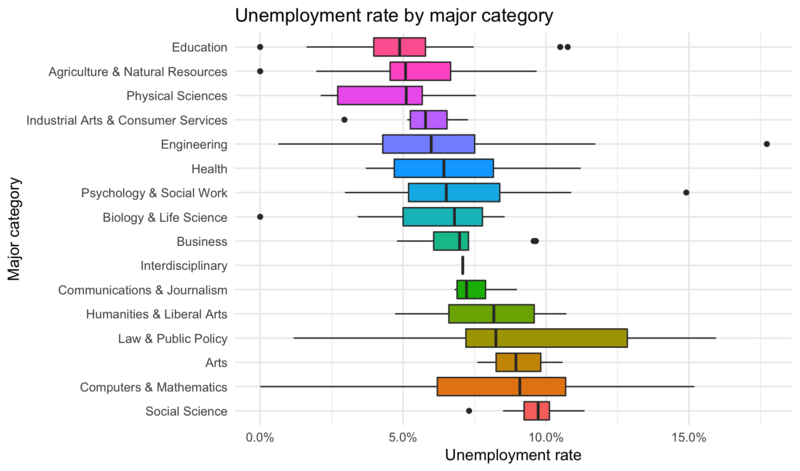 Let’s to the same thing here but before ggplot’ing, let’s mutate the major category to relevel it descending by the unemployment rate. Therefore the highest unemployment rate will be the first level of the factor. Let’s expand limits again, and flip the coordinate system. Most of these make sense except for the high median and large variability of “Computers & Mathematics” category. Especially considering how these had the second highest median salary. Let’s see what these were. Perhaps it was the larger number of Computer and Information Systems, and Communication Technologies majors under this category that were dragging up the Unemployment rate. What about “underemployment?” Which majors have more students finding jobs requiring college degrees? 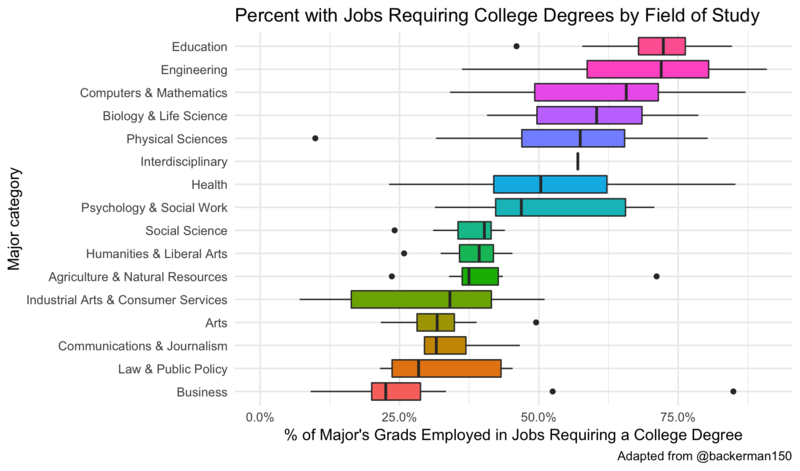 This time make a boxplot of each major category’s percentage of majors having jobs requiring a college degree (pct_college). Do the same factor reordering. What are the highest earning majors? First, filter to majors having at least 100 samples to use for income data. Try changing head(20) to tail(20) to get the lowest earners. 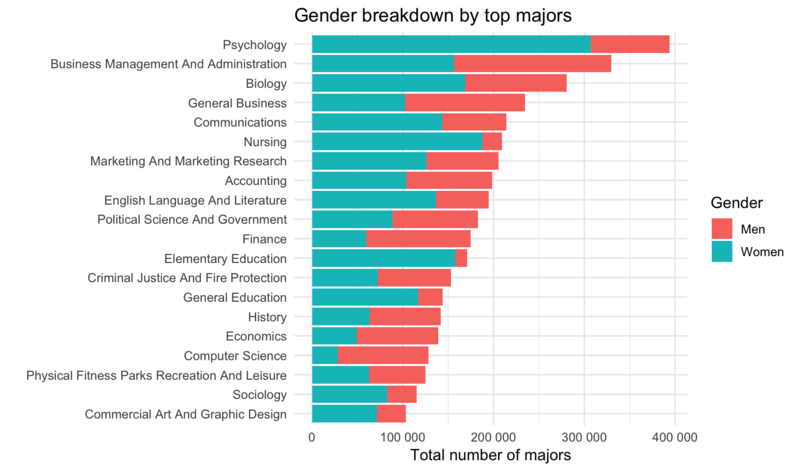 How do the top majors break down by gender? This plot first gets the top 20 most popular majors by total overall students. It reorders the “Major” variable by the total number of people taking it. It then gathers the “Men” and “Women” variable into a column with the number of men or women, with a key column called “Gender” indicating whether you’re looking at men or women. It plots the total number in that major, and color-codes by gender. What do earnings look like by gender? 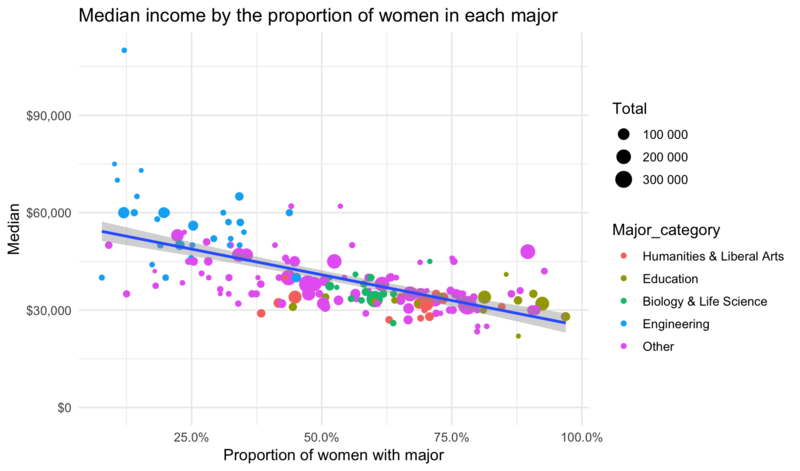 Let’s plot median salary by the Share of women in that major, making the size of the point proportional to the number of students enrolled in that major. Let’s also lump all the major categories together if they’re not one of the top four. I’m also passing the label= aesthetic mapping. You’ll see why in a few moments. For now, there is no geom that takes advantage of the label aesthetic. If you have the plotly package installed, you can make an interactive graphic. Try hovering over the points, or using your mouse to click+drag a box around a segment of the plot to zoom in on. Let’s run a regression analysis to see if the proportion of women in the major is correlated with salary. It looks like every percentage point increase in the proportion of women in a particular major is correlated with a $23,650 decrease in salary. Let’s run a similar analysis looking at the median income as a function of the percentage of majors getting a job requiring a college degree. Here’s Table 2 in the FiveThirtyEight piece. It uses the mutate_at function to run an arbitrary function on any number of variables defined in the vars() function. See the help for ?mutate_at to learn more.